Our diverse graduate students make meaningful contributions to the campus community by helping to solve complex research challenges. There is also a great deal of gender diversity on campus. 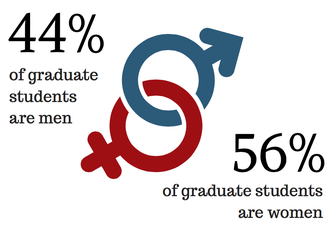 Women make up 56% of graduate students, and 44% are men. Graduate colleges have varying levels of gender diversity. Women are most represented in the colleges of education, liberal arts, and nursing. 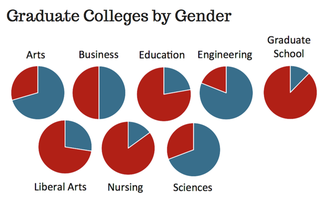 Men are most represented in the colleges of engineering, sciences, and the arts. Learn more about our colleges and departments and what makes each of them unique. During graduate school, an important consideration is financial support. 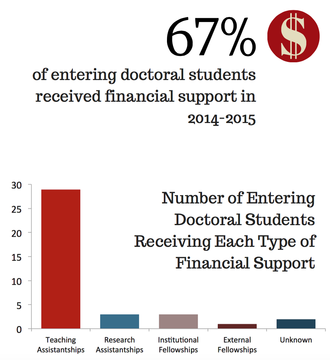 Many of our graduate students receive funding to complete their studies, with 67% of all entering doctoral students receiving some type of assistantship for financial support. Most of this support comes in the form of teaching assistantships. Many educational resources are available to ensure that graduate students from all backgrounds are able to thrive and succeed on campus. Visit the Graduate School to learn more!